A Breton fisherman has netted an extremely rare catch – a beautiful marine blue lobster. Mickaël Gault, a 40-year-old fisherman in Saint-Quay-Portrieux, made the catch of the year last week in the Bay of Saint-Brieuc, Côtes d’Armor. "Another fisherman had seen it off Saint-Quay-Portrieux, two or three years ago,” said Mr Gault. “But he did not want to talk about it." Despite this being a region of France famous for its seafood dishes, this unusual French find will escape the cooking pot as the restaurant that inherited it, La Cabane à Crabes in Binic, will instead put the lobster on display. For the restaurant boss, Martial Labbé, cooking the prized catch is out of the question. "We want people to see and admire it. We are looking for an aquarium in the corner that could accommodate it," he said. 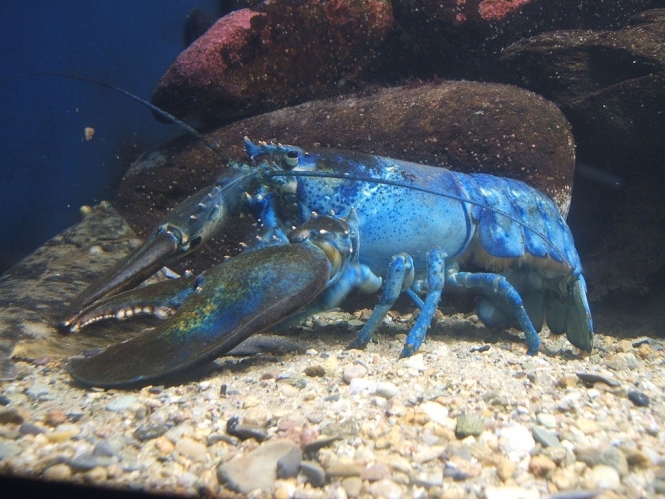 European lobsters have a slightly blueish tint but nothing like the vivid iridescence of the Brittany one and specialists at the Lobster Institute at Maine University, US, say only one lobster in two million has this beautiful colour, which is caused by a genetic anomaly causing the production of a protein. In May 2016, two Canadian fishermen each caught blue lobsters just 150km apart off the Nova Scotia coast, while in August a fisherman from Massachusetts on America’s East Coast made such a catch last August.